We have a cheapo Chinese incubator for hatching eggs. According to popular Internet postings, the calibration of the 'temperature setting' on the front vs reality inside isn't terribly accurate. 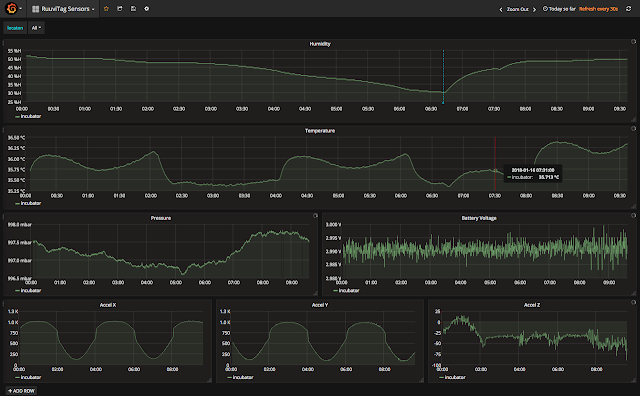 Since I have a stack of 'Ruuvitags' (https://ruuvi.com) from their kickstarter, I decided to put combine them with Grafana so I could start logging the data and plotting trends. First up, by default they broadcast an Eddystone beacon, so that you can simply see the data on a phone / tablet (via the Physical Web), however with Google dropping this feature, I decided to switch them to Raw mode which has a higher accuracy. This is done by simply opening the tag and pressing the 'B' button to toggle between Raw (LED blinks red) and URL (LED blinks green) mode. I'm using a Raspberry Pi 3 as a Bluetooth receiver. Running Rasbian 9 (stretch) means that I get a recent (v 5.43) version of bluez which understands BLE. 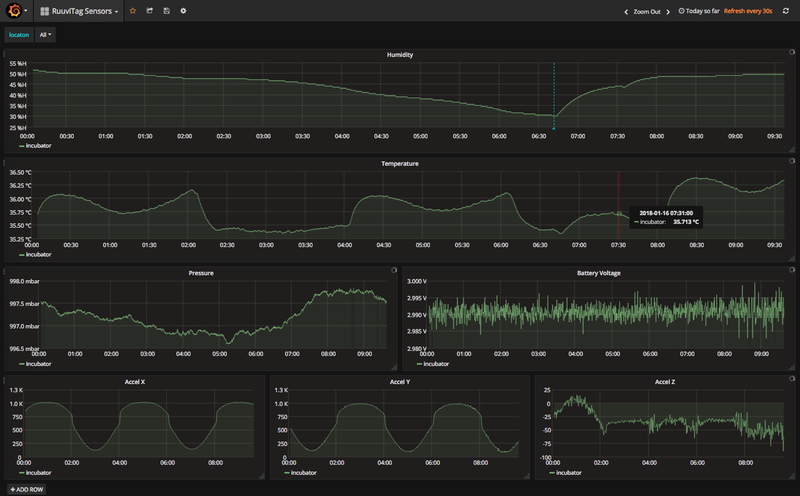 Although there's a Java app to push to influxdb, I'd rather use Python, so pip-installed the ruuvitag_sensor package. Initially this worked 'OK', but the logs were full of noise on the listener, so I hacked up a quick script based loosely on the examples. When done, it was much cleaner than the original and was picking up more of the broadcasts.